Goal Zero Yeti 1400 Lithium Generators have become essential in emergency preparedness plans. 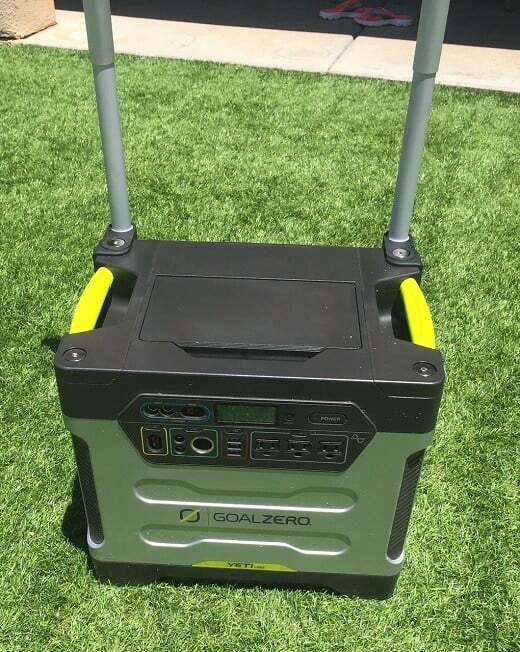 Goal Zero makes several excellent portable generators. 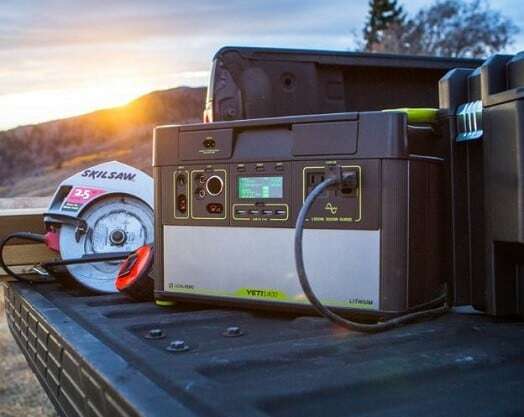 Here, we review the Goal Zero Yeti 1400 Lithium Solar Generator Portable Power Station. There are several portable power options available in the market today. Portable lithium generators are better than all these options in several ways. They come with more versatility, longer battery life and a compact design. Small lithium batteries have been around for quite some time, but Goal Zero has built an affordable lithium solar generator that can handle more demanding equipment. The Goal Zero Yeti 1400 is one of the best portable lithium solar generators in the market, but what scares people away is its price tag. The question is: Does the device perform better than the other portable power options? You will immediately know the Goal Zero Yeti 1400 Lithium portable solar generator is a powerful device when you first see it. The Goal Zero Yeti 1400 is about the size of a small cooler. The device’s dimensions are 10.1 inches by 15.3 inches by 10.4 inches. It weighs approximately 45 pounds. The Goal Zero Yeti 1400 also has large metallic handles to help you move it. This portable device can be charged in many ways and can power any electric device in your home. You can stash it in the basement just in case of a power outage or use it for a camping trip. Although the Goal Zero Yeti is one of the largest lithium power generators in the market, its design is not different from the other models. On the right side, it has two 120V outlets, four 2.4A USB ports, and a 12V electrical port which is similar to the ones found in cars. You also have an option of wiring your devices directly to the connectors, which comes in handy for running most 12V appliances. All Yetis are manufactured with the highest quality materials, including their pure-sine wave inverters. Which is why I highly recommend Goal Zero Solar Generators. The Yeti also has a large backlit LCD which uses very little power. The screen provides you with useful information like the amount of energy used, charging and the estimated time before the battery goes off. When there’s little power remaining, this option will help you use it responsibly. The Yeti is a durable device for both outdoor and indoor use. The device has a plastic casing that lasts longer than most battery packs available in the market today. Its feet are also made of rubber to absorb any ground impact. The Yeti also has got durable rigged plastic bumpers that protect the corners, and two metallic handles for moving it around. Before you start using this device, you need to charge it. The devices manufacturers ensured that you could charge the device in almost all circumstances by providing some charging options. The fastest and simplest way to charge it is plugging it in the standard 120v outlet. The battery will take up to 25 hours to become fully charged. For those who cannot access AC power, the battery comes with a built in solar charge controller. The rate at which the battery will be charged depends on how much sun you will get on that day and the number of solar panels you have. With just one solar panel, you will need several days to charge the unit fully. Ideally, you can use the solar panel to simply replace the power used in a day if your consumption is low. If you have no intentions of buying a solar panel, you can use your vehicle to charge the battery. The battery has a chargeable adapter that can be plugged into your cigarette lighter. The best thing about this charger is that the power passes through a separate charge controller. Most cars produce approximately 13.7V when running which is used by this controller thus efficiently charging the Yeti. Other controllers usually restrict current flow to 12V. The charging rate will depend on your vehicle’s alternator. The Goal Zero Yeti 1400 lithium solar generator has a 1425 watts lithium battery which can power up to 10 devices at the same time. This battery power is more than enough for your hungriest devices. With up to 118 hours of charge time for USB devices, 16 recharge times for laptops and a continuous 10 days of lighting a LED strip, this is one of the best devices on the market. The Yeti also has a pure sine wave inverter included which can supply up to 3000 watts of surge power and up to 1500 watts of continuous power. The sine inverter will help you to use heavy appliances like heaters, microwaves, coffee pots, and fridges. The power can sustain a full-sized fridge for a whole day. If the power supplied by these portable solar generators is not enough, there’s an extra expansion port under the lid. The port can connect several Yeti 1400 batteries. If you need a serious power supply, these ports will allow you to expand your power supply as much as you like. According to Wikipedia, another outstanding feature about this lithium battery is the fact that it doesn’t discharge even if it stays for a long time without being used. Also, no power is wasted for small loads and the batteries last ten times much longer than the standard backup batteries. Lithium technology is still very new which makes it quite expensive. While the batteries have some significant benefits, they are available at steep prices, but the more people embrace technology, the more the market prices drop, so you can expect the prices to drop after some time. With the Goal Zero Lithium solar generator, you won’t need inverters, converters and other fancy controllers to power up your devices. This power station comes with everything included, and for new users, the led display will provide all the necessary information they require when using the device. And for those who need portable energy in large amounts, this is just what they need. You can also watch the video to get a more technical review of the Goal Zero Yeti 1400 lithium solar generator.